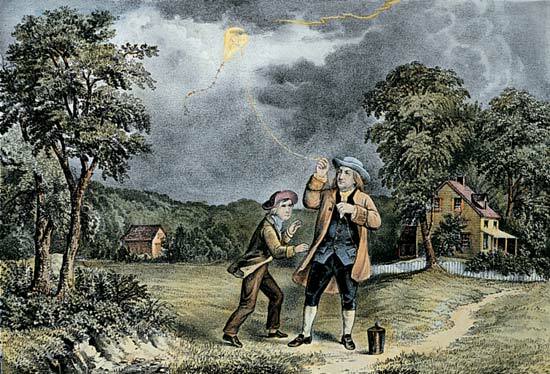 Benjamin Franklin's Experiments - Paoli Battlefield Preservation Fund Inc.
We all think we know the story of Benjamin Franklin, we know the story of him flying a kite in a thunderstorm, but do you know the other inventions he worked on? Join us on Monday, November 14th as we welcome Mike Kochan who will be presentation and demonstrating some of Benjamin Franklin’s Experiments. Mike will be bring some reproductions of Franklin’s machines he used in his experiments as well as audience participation in some experiments to help tell the story of Benjamin Franklin’s involvement in these scientific experiments. Mike’s presentation will show Franklin’s place in the history of the discoveries in electricity. The presentation will start with the Greeks, move to the seventeenth century then the eighteenth century and finish in mid eighteenth century with a demonstration of his famous kite experiment. The talk will use a combination of a power point as well as replicas of some of his experiments that the guests can do themselves bringing the history of developments in electricity to life. Mike has the ability over the years to make museum quality examples of the technology of the eighteenth and nineteenth century technology and is currently portraying Franklin in venues that include children as well as adults. Ben Franklin aka Mike Kochan, which some of his experiments at the Paoli Battlefield.